I am now part of the Visual Studio and Development Technologies expertise (coming from Windows Platform Development) which makes much more sense to me. 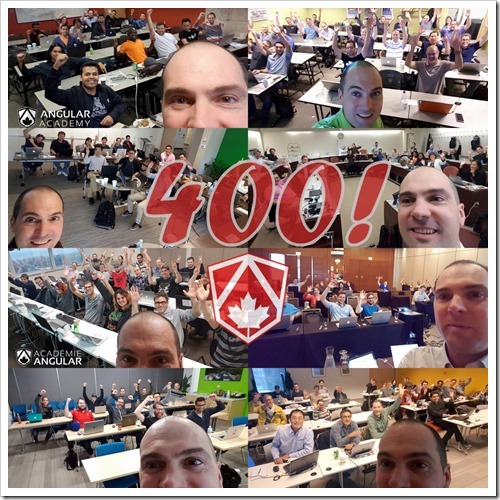 Through my Angular Academy in Canada I did 34 Angular workshops in 2016, I have now trained more than 450 developers to this awesome framework! My 10th MVP Award, a decade of Dev Community excitements! Today January 1st is special as this was the 10th time I got that email from Microsoft! This move was the best decision I made in 2015 (and probably in my career): I discovered Angular almost by accident, quickly saw that this is the way to go now for software development (and a true wake-up call, coming from a .NET, C# and Visual Studio backend, I now spend my time in VS Code with TypeScript. ), learnt a lot, created a dedicated training (the Angular Academy) that received a huge success (I did my annual turnover in just 3 months), and I am now confident that this is an amazing course as most of my classes have finished with a round of applauses! Most important is I have fun and continue to work part time. 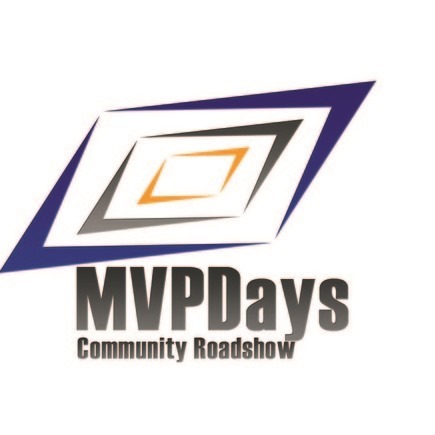 MVPDays is a one day event that focuses on content for IT and Dev Professionals sharing their knowledge allowing local communities to learn more and advance their skills based on real world experiences. This event will be in Montreal on Mar 4th, 2016. 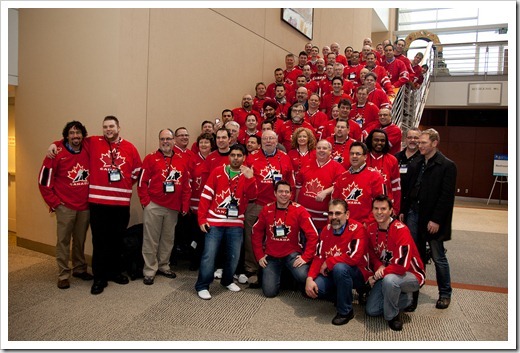 The first ever Microsoft Americas MVP Virtual Conference will happen soon. Please note this event is not just for MVPs, it’s for everyone! Re-Awarded Microsoft MVP for 2015! Even after all those years, I feel very honored to read one of the first email of the year announcing my MVP Award, for a 9th years in a row. As an active Windows Store developer, I am part of the Windows Platform Development expertise. Looking back at 2014: I have not been working a lot as this is my new way of life: Since I successfully sold my startup 2 years ago I chose to work just a couple of months per year and enjoy other part of life the rest of the time. But I still do share my passion for technologies as I really enjoy it. I have built way more than 100 Store apps and I have now ended my experimentation with Windows Phone. It was great, and I am now focusing only on Android and iOS apps with Xamarin as I want to get into those platforms as well. Windows 10 looks promising and I can’t wait to see business reactions… anyhow in 2015 I will still help people being successful with Microsoft technologies! Re-Awarded Microsoft MVP for 2014! I am thrilled and honored that once again, one of the very first email of the year is announcing my MVP Award, for a 8th years in a row. With a change this time: I have joined the Client Development expertise, which is a new group for Windows 8 and Windows Phone Insiders, which makes much more sense for me. Looking back at 2013: I have done tons of Windows 8 dev presentations (100% local, no travel = happy family) and was involved in more than 45 Store apps projects! I also had the chance to already help several customers with their Windows 8.1 development strategy. I am still focusing intensively on Windows 8 and Windows Phone Store Apps with XAML, C# and Azure, now I also want to start digging Xamarin as well. This is just the beginning… now for an awesome 2014!! 2012 has been an incredible ride, I got a second child, I turbo boosted my company with tons of great Windows Store apps projects, got awarded Microsoft Windows 8 App Partner of The Year. Now I have sold the company and ready to explore new challenges. I am thrilled to continue as an MVP for one more year as I plan to get closer to technical stuff, more than ever. Only drawback is I am still under the Silverlight category, which doesn’t make much sense for me now, as I have been focusing exclusively on Windows 8, Windows Phone and Azure for more than 1 year now. I can just think of it being a temporary period and I will be moved to something closer to Windows 8 later, waiting for this product group to establish how to deal with MVPs (they had a darn busy year I guess!). Let me be clear on Silverlight: it still is an awesome technology, it reached v5 and is a mature product, it makes perfect sense for several scenarios, it is (currently) way superior to the XAML option in WinRT (but this is temporary, and XAML in WinRT will catch up quickly without any doubt). Well, features comparison set apart, you know that the real difference is SL being cross platforms (but maybe not enough platforms). BUT obviously that technology doesn’t need MVPs anymore. So again, I hope to be migrated to anything Windows 8 related in the near future. Waiting for that, in the short term I see more value in the RD program, which suffer from a decrease in quality communications but still remains very interesting, and a position in which I want to stay more than MVP (but both are ok too!). Going back to Silverlight, I don’t want to judge *why* Microsoft de-emphasis Silverlight, but the WAY Microsoft did it was catastrophic, and a big mistake. Developers have been kept in the dark for months. It really hurt badly the community. People got angry. I saw lots of Silverlight guys fly to iOS or Android business, and I can totally understand that move. This total absence of communication and guidance from Microsoft was unacceptable, many developers have felt betrayed. The way Microsoft handled their shift in strategy was very poor if you ask me. I based my entire company on Silverlight, got a team of almost 20 dedicated devs, thanks to my connections I saw that coming and managed to successfully redirect the ship to Windows Store apps with XAML at the right time, but it could have been worse, no doubt it has been worse for some. My *emotional* point of view: I don’t really care. I am by far not in a position to judge what MS needs to do with their products. A Silverlight enthusiast ? An entrenched Silverlight expert? I am a Microsoft Partner. And I chose to be a partner, not Microsoft. 2. Stop being a partner and explore others vendors platforms. Simple as that. You have the choice. You can’t blame Microsoft for killing its own product. Except if you are a shareholder Microsoft owe you nothing. I mean, we certainly don’t have all the economics, numbers and market vision for such a decision. So as a Microsoft Partner we must follow or get off. I am comfortable with that.